Sometimes they led to nowhere at all. But did they really? Of course they led to somewhere. But now that somewhere is gone. 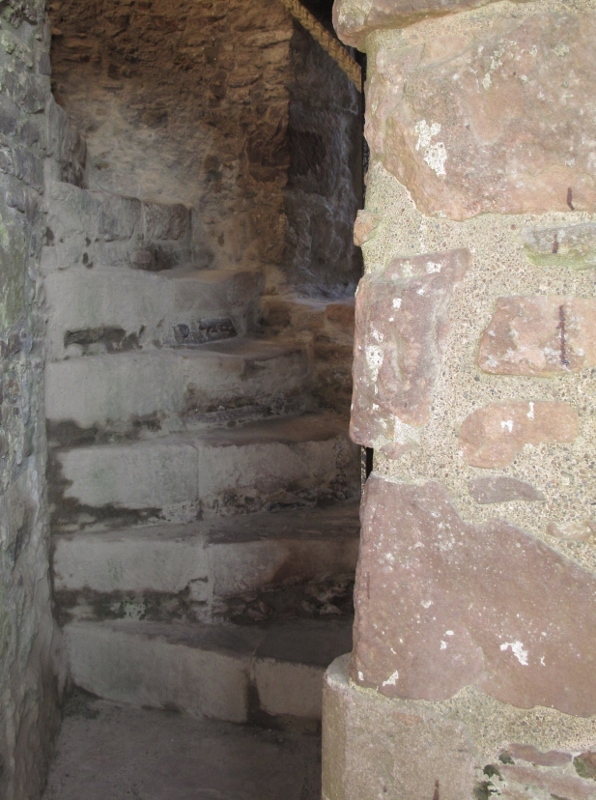 Do you ever imagine what it would have been like day in, day out, climbing these very narrow stairs? Can you imagine trying to pass someone on them? It’s hard to do. We would have to back up and let someone else come up the stairs. Why were they so narrow? You can imagine it would be a lot more difficult for an attacker to get to the defender with so little room to move. And two couldn’t come up at once, shoulder to shoulder. One would have to follow the other and couldn’t fight until the guy ahead of him was out of his way. Note also the curve to the stairs so that the defender coming down could swing his sword and the attacker, if he was right-handed, could not. I wonder if anyone thought about that in teaching their sons swordsmanship–to fight with both hands, to swing as well with the left as the right? So strange. I would ask myself the same questions.